I didn’t know it would be like this. That something elemental in me would know that here is where I needed to be…this is home. The sounds….the very scent of the air is “home”. How can it be that I longed so deeply for this green place and never knew it. The images in my head are superimposed on other images. The beautiful house that I grew up in is a sad thing now. The trees that once shaded it are gone…but the bay window where my grandmother sat for nearly 24 hours rocking her new son….the one that never took a breath….it remains. The woods over the hill….where I played and my father before me…gone. But the steps that lead down the hill…the ones he used to fly down with his sled on snowy days..it remains. The apple tree outside my bedroom window..the one with apples so crisp and juicy and tart…it lives only in my mind. 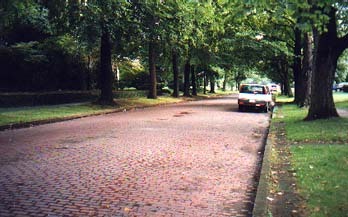 We found some of the streets are still paved in red brick and the streets are tree lined and people are still sitting out on their front porches. The old courthouse and the band stand still look as grand as ever in the “square”. I walked in the old cemetery for a long time, hunting for my grandparents grave, but Rick had to go and ask…she looked in a ledger so old the edges had holes…and we so we found the place. We are staying in LAKE PARK . (It’s a city park now.) This is the place where my mom spent summers with her friend Nell, who had a little cabin there. My dad would fly his bi-plane over the lake *extremely* low to impress her, so low that boaters would stand up in their row boats and shake their fists at him! I remember the lake as being soooo much larger. Mom and I used to walk in the woods and look for tiny Lilies of Valley. ( I can smell their delicate perfume in my mind.) I wonder if they grow here still? The old dance pavilion where the ‘big bands’ played and Rudy Valley sang while they danced, is here yet. 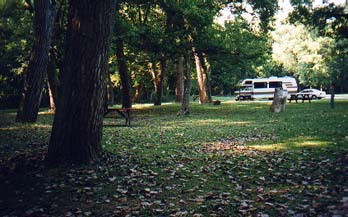 The campground is nearly deserted. It’s so peaceful and with huge old trees. It’s late now and the insects and the frogs are singing their hearts out. When we were coming into town from Zanesville, nearly every house had a large tree down or at the least a large limb. They had a tremendous storm here yesterday. Today is clear blue with puffy white clouds and cool….blessedly cool! There are just the beginnings of the turning of the leaves…but it is starting. Tomorrow we want to find a place to send E-mail..it’s backing up on us! And continue to explore this *home* place.